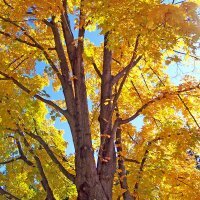 The principal function of leaves is to absorb sunlight to manufacture plant sugars through a process called photosynthesis. Leaf surfaces are flattened to present a large area for efficient light absorption. 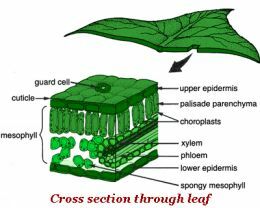 The blade is the expanded thin structure on either side of the midrib and usually is the largest, most conspicuous part of a leaf . A leaf is held away from its stem by a stem-like appendage called a petoile, and the base of the petiole is attached to the stem at a node. Petioles vary in length or may be lacking entirely, in which case the leaf blade is described as sessile or stalkless. 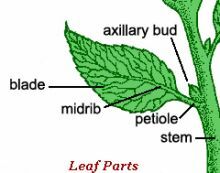 The node where a petiole meets a stem is called a leaf axil. The axil contains single buds or bud clusters, referred to as axillary buds. They may be either active or dormant; under the right conditions, they will develop into stems or leaves. A leaf blade is composed of several layers . On the top and bottom is a layer of thick, tough cells called the epidermis. Its primary function is to protect the other layers of leaf tissue. The arrangement of epidermal cells determines the leaf's surface texture. Some leaves, such as those of African violet, have hairs (pubescence), which are extensions of epidermal cells that make the leaves feel like velvet. The cuticle is part of the epidermis. It produces a waxy layer called cutin, which protects the leaf from dehydration and disease. The amount of cutin on a leaf increases with increasing light intensity. For this reason, when moving plants from shade into full sunlight, do so gradually over a period of a few weeks. This gradual exposure to sunlight allows the cutin layer to build up and protect the leaves from rapid water loss or sunscald. The waxy cutin also repels water. For this reason, many pesticides contain a spray additive to help the product adhere to, or penetrate, the cutin layer. Special epidermal cells called guard cells open and close in response to environmental stimuli, such as changes in weather and light. They regulate the passage of water, oxygen, and carbon dioxide into and out of the leaf through tiny openings called stomata. In most species, the majority of the stomata are located on the underside of leaves. Conditions that would cause plants to lose a lot of water (high temperature, low humidity) stimulate guard cells to close. In mild weather, they remain open. Guard cells also close in the absence of light. Located between the upper and lower epidermis is the mesophyll It is divided into a dense upper layer (palisade mesophyll) and a lower layer that contains lots of air space (spongy mesophyll). Located within the mesophyll cells are chloroplasts, where photosynthesis takes place.